14/365 – “Myself” nr.14, a photo by Luca Rossini on Flickr. This is my meal. Well, a typical meal. I don’t eat pasta every day. But many, yes. And I don’t eat on the terrace every day. But many, yes. This is the beauty of living in Rome, good food and good weather. And every second of free time becomes quality time. Without my meal it would be bitchy time, instead. I suffer a lot of self-diagnosed low blood sugar, which means that if I don’t get any food for more than four hours I get slow in thinking, jumpy and, basically, bitchy. In short, these are the things that separate normal Luca from primadonna Luca. So, this is my meal. What does it tell about me? I guess it shouts that I’m Italian. The tomato pasta, the white wine, the parmesan cheese in the little cup, the good weather in winter, they all speak very much Italian. 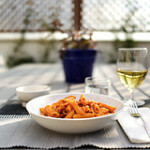 It also says that I know how to cook my pasta (do you notice how the penne pasta properly absorbed the tomato sauce? ), and that I try to keep a low-fat diet from being depressing. 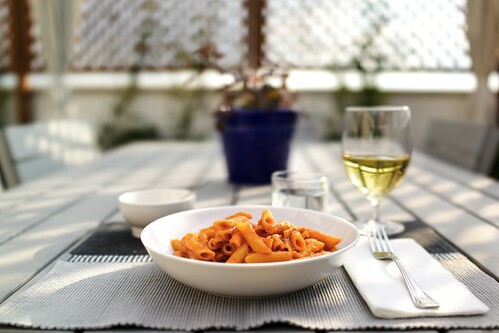 Without my good-food / good-weather meal I would be simply unsatisfied by life. I already know this. You can’t take me, remove the good food, put me in a cold and dark country, and still have the same person. It simply does not work. Luca really enjoying this project, its very interesting to see how someone else lays out a project, never thought of a project based around Who am I.